To be honest, it’s messing with my head to consume so many calories. I’m still averaging 2100 calories on workout days because that’s around maintenance level for me. On days I don’t workout I will be eating around 1900 calories. After going so many years thinking about how to get smaller, I have to change that mindset. I have to eat to grow! I was thinking last night, “You know what? 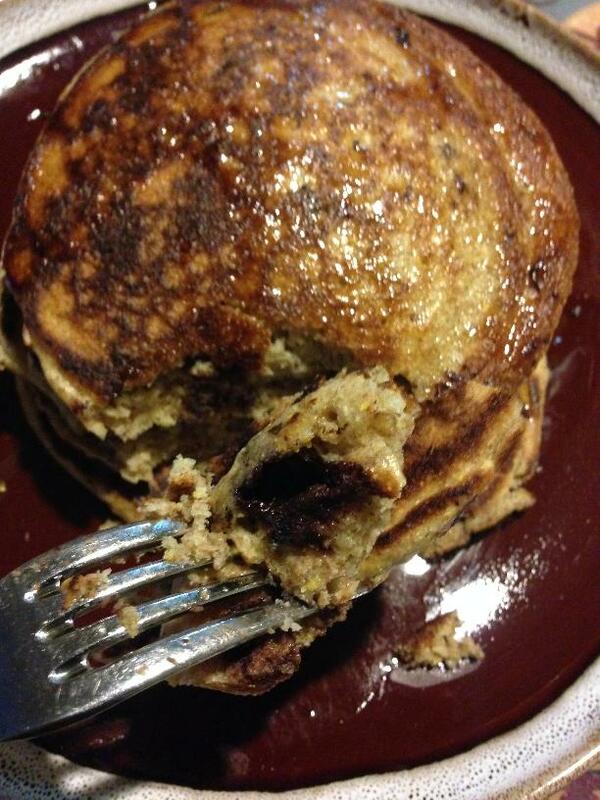 I want some chocolate chip pancakes”. If it fits your macros right? I made a “clean” version of this with whole wheat pancake mix, prepared as packaged, but added broken up chunks of 85% organic dark chocolate to the batter. I cooked the pancakes in coconut oil and topped with pure maple syrup. I’m thankful for the chocolate that I am able to receive! Simple lunch, a salad with romaine, smoked salmon, and avocados (would have had tomato if I hadn’t run out!). 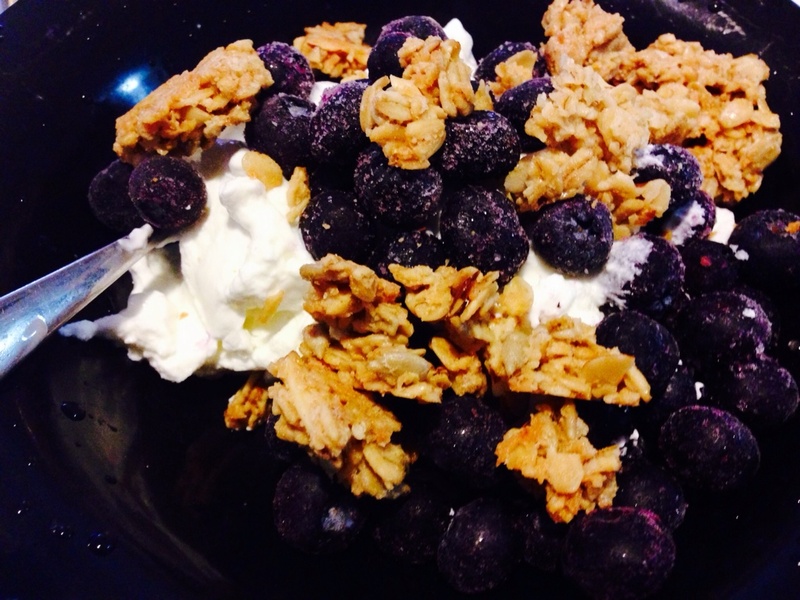 Side of greek yogurt with blueberries and granola. 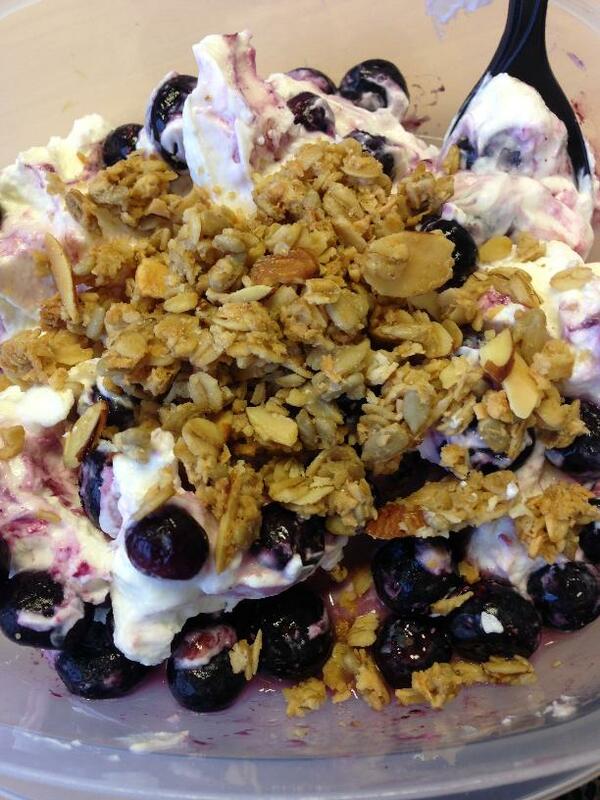 Greek yogurt parfait – 1 cup (227g) Fage Greek Yogurt (2%), 1/4 cup Michele’s original granola (28g), 2/3 cup frozen blueberries (85g). Continuing with my chocolate obsession, I tried something new. I blended chocolate frozen yogurt with chocolate whey powder for extra protein. This was so delicious! If you’ve ever had a frosty from Wendy’s, it was the same consistency and had a very similar taste. I topped it with a few strawberries, you know, for health. Of course this gave me the sugar rush I needed for an awesome workout! After a hard weight lifting workout, I wanted to eat BIG. I planned in a lot of carbs following this lifting session to replenish those glycogen stores and allow my body to use the protein for muscle building! I know this isn’t the best plating, but bear with me, I was famished and arms were wobbly :-). Herb and mustard salmon (wild salmon baked with dijon mustard, garlic, rosemary, and black pepper), with a side of brown rice, baked sweet potato with cinnamon, and kale. Not pictured is a side of 2 cups of romaine (gotta get my greens!). 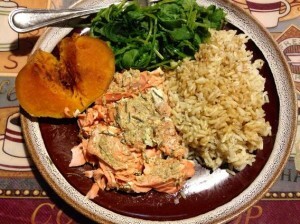 Ingredients: 4 oz wild coho salmon, 1 cup brown rice, 2 cups raw kale, 1 medium sweet potato (114g), 2 cups romaine lettuce. 529 calories, 67g carbs, 42g protein, 11.1g fat. This is a full body lifting regimen. I noticed that I was lifting much more than I have been, and I suspect it is because of all the extra calories! I woke up famished! The day after lifting weights I’m always extremely hungry. Anyway, here’s how my day went! Scrambled eggs with smoked salmon, and a cinnamon raisin English muffin with coconut oil. Veggie burger and chili sweet potato fries. 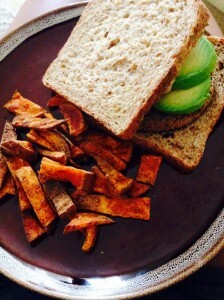 The sweet potato fries I made by cutting 1 medium sweet potato into strips, then tossing with 1/2 tablespoon coconut oil and chili powder to taste. I baked at 350 and flipped the fries about every 5-10 minutes. I kept them in until crunchy (keep your eyes on these so the thin slices don’t burn). I love pizza! This is a slightly healthier version. 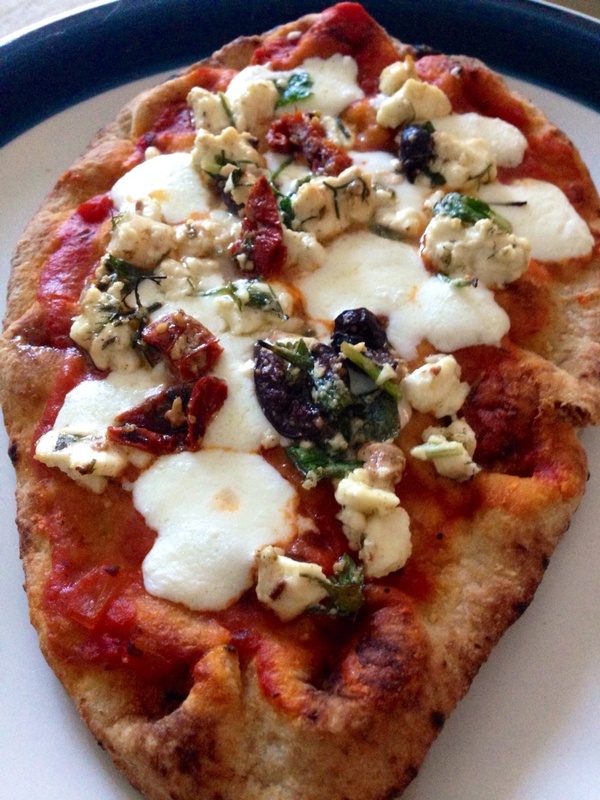 Mediterranean whole grain naan pizza. I made this by topping a whole grain piece of naan with tomato sauce, fresh mozzarella, feta, sun dried tomatoes, and kalamata olives. I baked at 350 until crust was crispy at the ends and cheese was melted. I worked out and then had my post workout meal along with dinner. 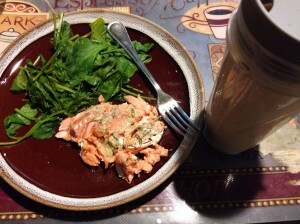 I had a short circuit training workout, so I didn’t really need as many carbs for recovery. I don’t believe in spacing out meals by 3 hours to eat 5-6 meals. I’ll explain in a separate post, but for now here’s what I had. Mango and strawberry protein shake, with salmon and steamed kale. 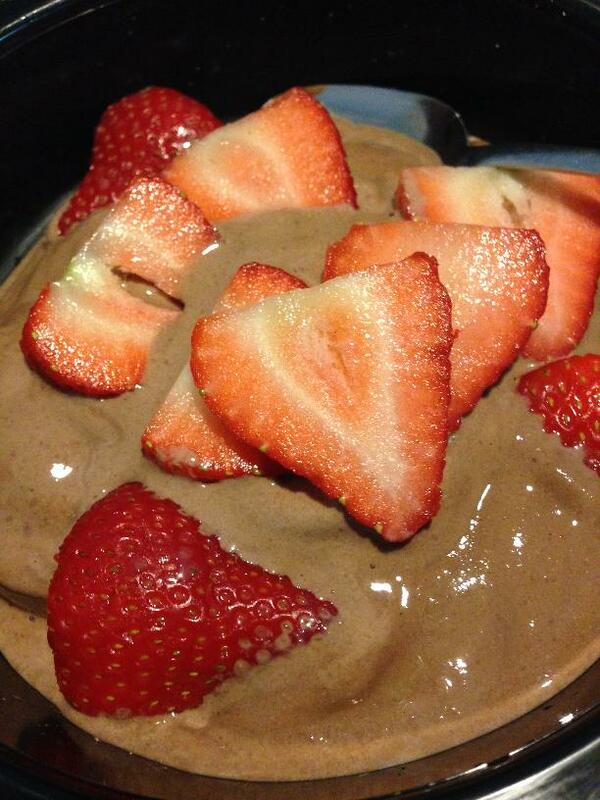 214 calories, 25.8g carbs, 19g protein, 4.0g fat. Meal Total: 390 calories, 29.3g carbs, 10.7g fat. Total of about 40 minutes, with a brief break between the two. Today’s goal is to eat around 2100 calories, and for about half of those calories to come from carbs. I’m on a muscle building spree and muscles need fuel! It is pretty well known that muscles need protein to grow, but one thing that I have overlooked all these years is the role of carbohydrates in muscle building. No more low carb diets for me ever! All these carbs will go to use – providing energy for workouts so my precious protein can go towards muscle building! 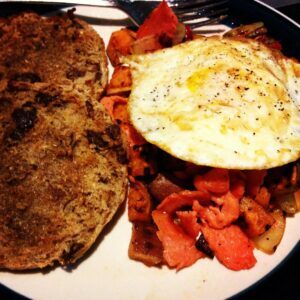 Sweet potato and smoked salmon hash with a fried egg. Ezekiel cinnamon raisin English muffin on the side. For the hash, I chopped sweet potatoes, oven baked them a bit to soften them, then sautéed onion, red pepper, and the sweet potato in coconut oil. 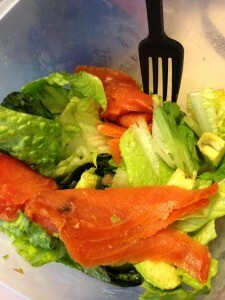 Once these were soft I added smoked salmon and cooked until the smoked salmon was light pink. I topped this with an egg that was fried in coconut oil. 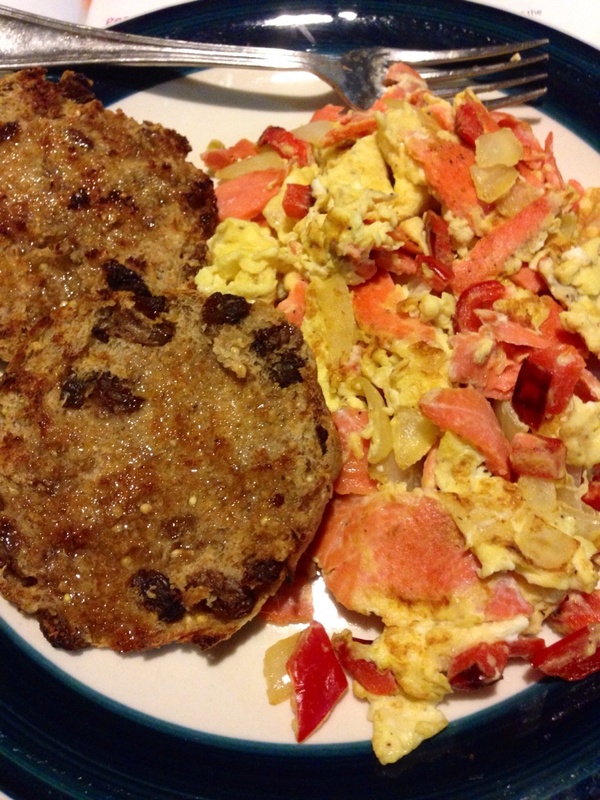 Ingredients: 57g smoked salmon, 1 medium sweet potato, 1 large egg, 1 tablespoon coconut oil, 1 whole muffin (Ezekiel cinnamon raisin), onion and red pepper (not included in count). 554 calories, 60g carbs, 30g protein, 24g fat. Ingredients: 1 cup (227g) Fage Greek Yogurt (2%), 1/4 cup Michele’s original granola (28g), 2/3 cup frozen blueberries (85g). 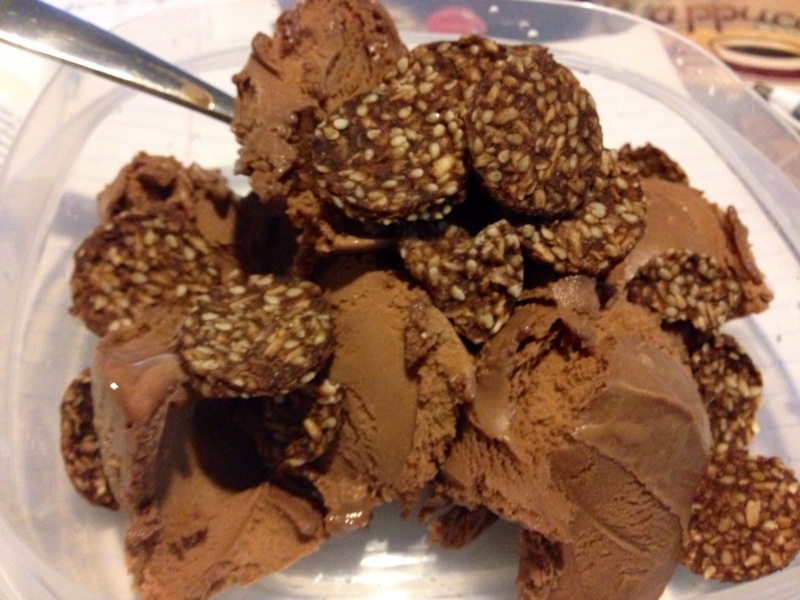 Dark chocolate frozen yogurt and raw chocolate cookies. This is a sugar packed combination that helps provide natural energy to get through the workout. You’ll see that I really just structure how I eat around what workouts I do. This workout was a long weight lifting session with some high intensity cardio, so I had plenty of carbs before and after the workout. Protein shake with mangoes, strawberries, unflavored whey powder, and real vanilla flavor. Veggie burger with “cheezy” kale chips and tomatoes. Maybe not that appetizing to the average Joe, but it hit the spot! 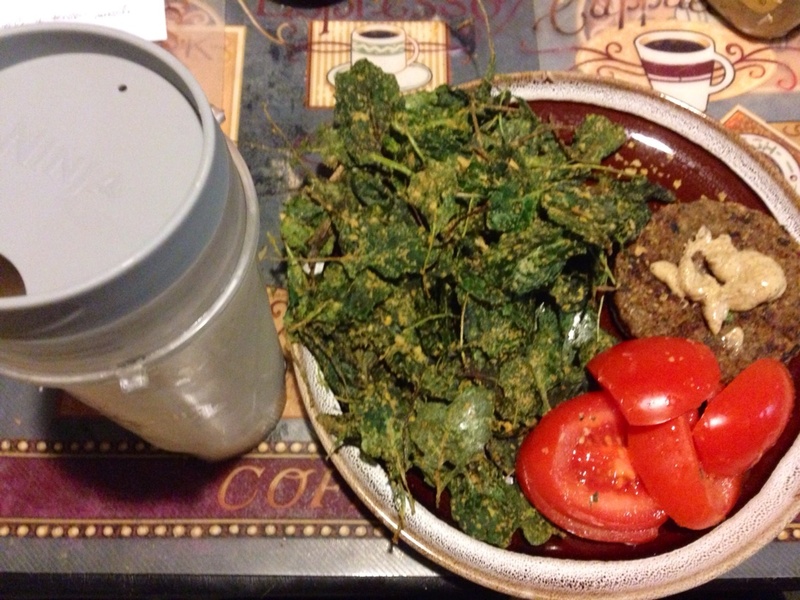 To make the kale chips, I rubbed 1/2 tablespoon of olive oil into the raw kale, topped it with nutritional yeast to make a “cheese” flavor, and baked on 250 until kale was dried and crispy. 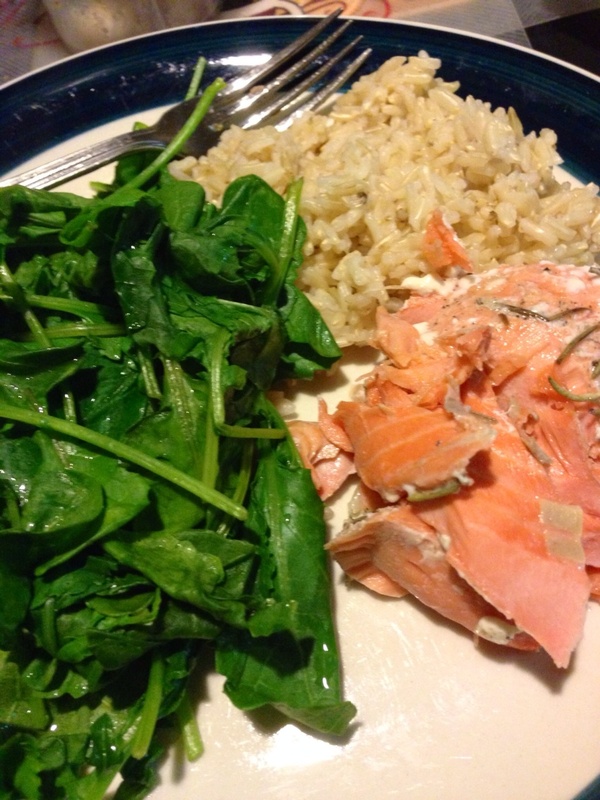 Salmon, brown rice, and kale. And a big chunk of romaine lettuce (because I didn’t feel like making a salad?). I like to get plenty of leafy vegetables per day – at least 2 servings daily. This is because they have a lot of nutritional value for very little calories. The salmon is very lightly seasoned with black pepper, garlic, and rosemary. Ingredients: 2 cups raw kale, 1/2 cup cooked long grain brown rice, 3 oz salmon. 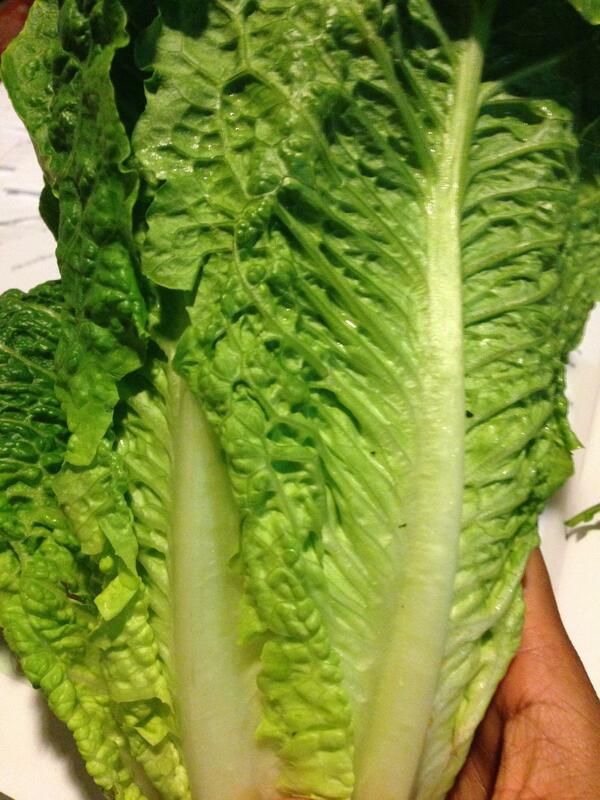 4 cups romaine. I have decided to hold myself accountable for the world to see. By the world, I mean the handful of people who actually follow this blog. I will post an online food and workout journal for the next 8 weeks. Not only does this keep me accountable, but it also gives some insight into how I eat and the types of workouts I do. You may be surprised to see that I don’t “diet” in the sense that I don’t cut a lot of calories and I don’t cut out different food groups to reach a goal. Most days I “eat clean”, meaning I eat whole foods that are minimally processed. This is because I don’t like the idea of lab made foods, not because of a fitness goal. Some days I eat processed foods as well because I believe in having a balance. You will notice some days I may eat pescetarian (no meat other than fish/seafood), but also occasionally eat vegetarian or vegan: once again this is just my lifestyle, not due to any specific fitness goal. My workout routine is mainly weight lifting and high intensity cardio. Sometimes I follow a routine, sometimes I do what I feel like doing. Some days I go hard, some days I don’t. Some days I’ll do two workouts in a day if I feel like it! I also build 1-2 rest days per week into my routine. DISCLAIMER: This is just me sharing what I’ll be doing over these 8 weeks. This is by no means telling you what to eat or what workouts to do. I am using my own research and studies to build a plan for myself. Though I will provide information on why I make certain decisions, each individual has to tweak their food and workout routine according to their body and goals.